At True Pro Quality Roofing, Inc., we want you to have every opportunity to contact us when you need us the most. We realize that when there is a roofing emergency, timing is critical and you are depending on us for a prompt, courteous response. Below you will find all of our contact information, including our mailing address, telephone number, fax number, email and an emergency mobile contact number. If you have an immediate need, please contact our emergency mobile number at 214-535-2514. For your convenience, you may also request services from this site. Feel free to click here and email a request form. We will contact you as soon as possible. 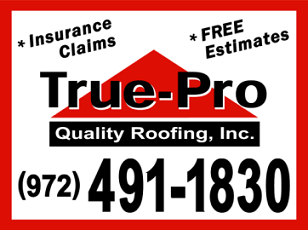 We would like to thank you for your interest in True Pro Quality Roofing, Inc., we look forward to completing your roofing project in the near future!